Bringing up Bella: "A person is the best thing to happen to a shelter pet." "A person is the best thing to happen to a shelter pet." If you've been reading the blog for any length of time, you may have picked up on the fact that I am a big supporter of animal rescue and shelter pets. Not only is Bella a rescued shelter dog, but I volunteer with a couple of different rescue groups as a sort of pay-it-forward gesture to those who saved her in the first place. Well, shortly before Thanksgiving week, I received an email from a 'fellow animal lover' (thanks to Christine from Brando and Bogart for that bit of phrasiology) asking me to share some information with you, my dear readers. Since the request had to do with saving lives and getting animals out of shelters and into loving homes, all you have to wonder is how quickly I said "Sure! Where do I sign up?" Have you heard of The Shelter Pet Project? 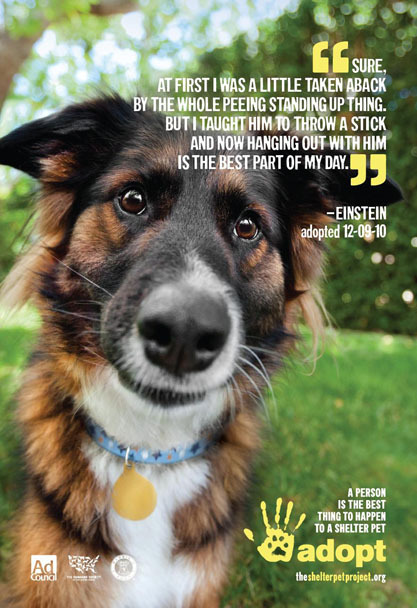 You've probably seen a few of the ads floating around cyberspace lately but did you know The Shelter Project is a collaboration between The Humane Society of the United States, Maddie's Fund and The Ad Council with the primary goal of making "shelters the first place potentional adopters turn when looking to get a new pet?" The current series of ads is designed to highlight the bond between shelter pets and their adopters in an upbeat, light-hearted (not soul-crushing) way. According to the Project's web site, "seventeen million people will acquire a dog or cat within the next year." yet "2.7 million healthy and treatable pets are still losing their lives in shelters each year." Think about that: it would only take about 15% of that 17 million to save all 2.7 million pets! Pet adoption is on the rise having increased by 2% in the last 2 years and euthanasia is dropping but myths and stereotypes about shelter pets still abound. We need to continue increasing public awareness to the joys of adopting shelter pets and The Shelter Pet Project is a great way to start. Isn't that great? How would you like that to be your dog? And that's the goal of the campaign. Subscribe to their channel on Youtube. But you can also direct all your friends, and anyone else who tells you they are thinking of getting a new pet, about The Shelter Pet Project website. There they'll be able to search for dogs and cats in their area who are looking for new homes. The web site can also put them in touch with shelters and rescue groups in their area. All they need to do is enter their zip code. So I hope you'll help me in spreading the word about this wonderful campaign to help make shelter pets the first option people think of when looking for a new pet for their home. And when it's your turn to add a new pet to your family, please remember: "A person is the best thing to happen to a shelter pet. Be that person. Adopt." Bella and I thank you. It starts with us! Wonder how far we can take this so everyone can help a shelter friend! Very cool. We'll share the news. We are so glad that shelter adoptions are going up because mixed dogs are awesome too! You get the best of two or three breeds! Ruff! That is great! What a wonderful project! Hi Koot! Thanks for spreading the news. While I'm sure everybody knows I'm a big fan of mixed breed dogs, it's important to remember that there are also plenty of pure bred dogs in shelters and rescues. The shelter nearest my home right now is over-run with pure-bred Beagles (I think we have like 6 of them!!) There's also the most gorgeous pure-bred Black Lab there (who really needs to get out - want a playmate? ;) And we've had a Basenji and two Doberman's pass through in the last few months. But you're right - mixed breeds are pretty awesome dogs, too - like you said, best of a few breeds in one dog and they often have fewer health concerns. Thanks for visiting. I realized as I was researching this, I've actually been a fan of The Project on Facebook for a while now but I guess they are gearing up for a new phase. Seeing lots of activity around it now. Hope you'll spread the news. And thank you for letting us participate in the blog hop. I know it wasn't mischievous but hoped you wouldn't mind. I'm not sure which I liked more, the video or the poster. I am a huge promoter of breed rescues among friends and family and in the virtual world. We have had such an amazing experience with our Shelties. We continue to support that group and other local shelters when they have events. We also direct people to Petfinder as that is what led us on the path to finding our breed rescue. Thank you for sharing this and I loved the videos...the sandbox one had me laughing out loud. While we did buy Tucker from a breeder we do have a rescue put Stewie who melts my heart. I don't know what his story was before he came into our lives but I know it must have been scary as he doesn't like loud male voices. Still he has come a long way and though he still gets scared and is submissive what he needs and wants is love and we freely give it. If I could I would open my home to more homeless pups...maybe someday. I look forward to reading your blog (thank you for visiting mine!) and learning more about The Shelter Project. I'm a fan of rescuing dogs in general. I've been particularly impressed with the 2 breed rescues I volunteer with - they do such an incredible job of matching people with the right dogs and they stand by those dogs forever - it's inspiring. We're lucky to have a very good system of shelters up here (btw, I think you're also in MA?) and, like you, we try to attend the events whenever we can. Both your dogs are absolutely adorable. A puppy could be just what Stewie needs to give him a little confidence. I found your blog through the Monday Mischief Blog Hop. I love this post and your thoughts on rescue! I am in rescue (and also foster litters of rescue puppies) and have found it to be the most rewarding work! Great blog! I'm now a follower!! Terrific post, we love shelter dogs (and kitties here). This is a wonderful project and we love the videos too, very clever! Hi! Thanks for stopping by and introducing yourself. I'm following your blog now, too. I love what you're doing with fostering - that's simply not an option for us what with Bella being a little psycho and all. ;) So I try to help where I can but I really admire folks who do foster work. It must be very rewarding. I look forward to watching your latest group grow up and exploring your blog. Thanks for visiting and thanks for adopting! It is all baby steps. To be honest, I was surprised the adoption rates have gone up in this economy since all I ever seem to see are the dogs being given up by families who can no longer afford their care. I have to stop focusing on that and pay attention to how many of those dogs we are able to place in new homes - and that's a good thing. 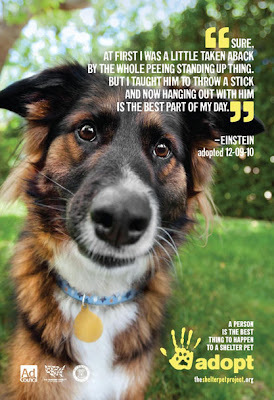 Education and awareness are so important to improving the odds of shelter pets, so thanks for helping to get that word out there. Wow - yeah, it sure could be. This blog is a shining example of that! i love this campaign. i need to go double check that i'm connected to them on FB and Twitter. Isn't wonderful? I'm so glad to see campaigns getting away from 'shaming' people in to caring and focusing more on how great these animals are to have in your life.